Any visitor to Israel quickly realizes that felafel and schwarma may be the national food, but schnitzel is served EVERYWHERE. Of course food companies cashed in on its popularity and sell frozen schnitzel at the supermarkets. Just throw a couple of frozen pieces in the oven/microwave for half an hour and your kids have a warm meal. Effortlessly. You can even find frozen schnitzel pieces in the form of stars and rings and even various shapes dinosaurs! Just in case junior likes to eat AND play with his food. One of the frozen schnitzel marketing ploys was to sell thin frozen schnitzel pieces. I am not quite so sure what the reasoning behind this is. Pay more for less chicken? 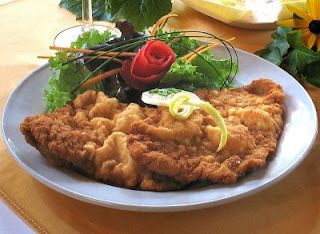 If you buy a skinny piece piece of schnitzel then you yourself will stay/become skinny? The skinny schnitzel people have gone even one step further. Israeli's are lucky enough to be able to toast their schnitzel! 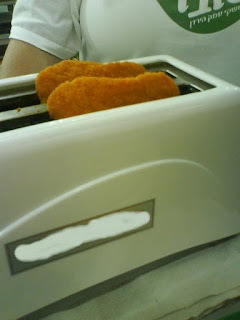 No longer do you need a crude and extremely passe oven or microwave to heat up the frozen schnitzel pieces - just pop them in the toaster! Please see Photo B as proof. I took the photo at a demonstration in a supermarket. I will let you know as soon as (or if) I see anybody using the schnitzel toaster in a real life situation! Would YOU Sit on this Couch?